Offices can become unbearably hot in the summer or too cold in winter. With windows often having to remain closed to control external noise or pollution, keeping office buildings comfortable presents a major challenge for most building managers. A range of air conditioning is available for purchase, with equipment suitable for small offices, open plan areas and large meeting rooms and conference facilities. Keeping your staff cool in the summer and warm in the winter is the ideal way to keep a team motivated and keep visitors comfortable. Staff often work in close proximity and ever-increasing quantities of IT equipment generate even more heat. 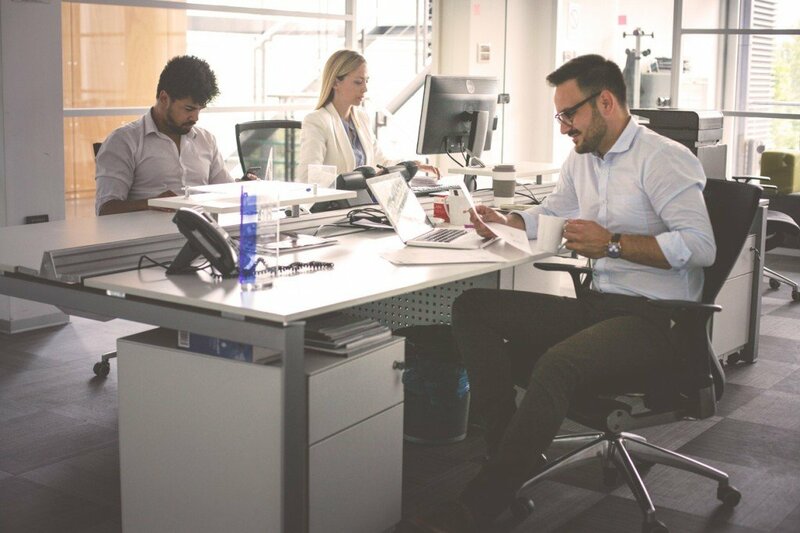 Our sleek and compact air conditioning units are ideal for both small and large offices where multiple areas must receive balanced cooling and heating - ensuring people can work to their full potential, which is crucial to the success of any business. We know that all office spaces are different and so aim to advise you on the most suitable equipment from our extensive range, whether it’s wall mounted, ceiling mounted or ducted. Productive meetings solely rely on all participants remaining fully engaged and focussed on the matters being discussed. People’s ability to concentrate and remain productive can be majorly affected if they feel too hot or too cold. Our cooling and heating equipment is commonly used to provide an effective climate control solution for meeting rooms with high occupancy rates, as they are often fixed closed, preventing the use of natural ventilation. All our equipment is discretely designed and almost silent in operation, ensuring no disruption to participants. Our expert team are able to recommend and install an appropriate cooling and heating system to suit your requirements - guaranteeing that all staff and visitors feel comfortable. Air conditioning is becoming an essential fixture in archives, to control temperatures within the storage room and prevent it from becoming overrun with moisture and mould. Without a suitable air conditioning system, the archives entire contents can become vulnerable to damage. In order to protect these irreplaceable documents, it is therefore imperative that a controlled solution is put into place to protect important books, maps and other articles. Andrews air conditioning units are ideal for maintaining consistent storage conditions in archive rooms - with our extensive range of cooling/heating systems designed to stabilise humidity levels and provide effective conditions for big and small storage rooms.